Do you keep getting told that you look tired or warn out? Under-eye veins are a common issue that might be to blame. These veins are among the most difficult facial cosmetic issues to treat on your own. Fortunately, a number of tried-and-true clinical methods are available to help you get rid of those stubborn blue veins for good. As the skin beneath the eyes is so thin and delicate, it’s a prime spot for blue veins, dark circles, and under-eye bags to develop. People with lighter skin tones are at a higher risk of developing facial spider veins and visible enlarged blood vessels. Genetics, prolonged exposure to the sun, and aging are also determining factors. With time, the skin becomes thinner and less elastic, making these veins even more prominent and difficult to treat. The following will help you determine which vein removal treatment option is best-suited for your unique situation. As one of the most popular vein removal options available today, laser treatments have a high rate of success and take a convenient, non-invasive approach to the job at hand. What’s great about laser treatments is that they also stimulate blood flow in the eye area, which helps target under-eye circles and dull skin in addition to veins. These treatments are performed in 15- 30 minute sessions, using specialty laser systems such as CoolTouch Varia or Cutera CoolGlide. Most devices target the veins with pulses of light energy that cause the blood inside the vein to coagulate. The deconstructed blood vessels are then reabsorbed into the body. As far as vein removal procedures go, lasers rank relatively well in terms of the potential risks involved. With that being said, there is a chance of blood clotting, which can trigger serious eye complications.As a result, many doctors use an internal eye shield to protect patients while they’re being treated. A cooling gel is also applied to protect the delicate under-eye skin and make the patient more comfortable. When compared to other vein treatment options, laser treatments are relatively safe with few complications and side effects. In fact, one of the best things about laser treatments is that they can be performed painlessly with almost no recovery time involved. As with any under-eye vein removal treatment, lasers come with some risks to the eyes and surrounding area. In some cases specialists recommend foam sclerotherapy to remove mild blue under-eye veins. This in-office procedure requires the insertion of a solution, usually sodium tetradecyl sulphate (STD), into the vein. Doctors mix the solution with air in order to create a foamy texture, which provides better results than traditional sclerotherapy. Small needles containing the foam STD are then inserted into the visible vein and flushed with a salt solution containing a blood-thinning agent. This causes the veins to collapse and fade. Two to three sessions are required, depending on the size of the vein you want removed. In general, the procedure is performed under local anesthesia and requires almost no downtime. Some patients report a slight stinging sensation — similar to vaccination or having blood drawn — but it’s usually painless. Another benefit of foam sclerotherapy is that it leaves minimal scarring. Foam sclerotherapy isn’t the most popular option for patients who have larger, deeper veins as surgery and laser treatments are best-suited in these instances. Compared with surgery, under-eye sclerotherapy is an excellent option for those seeking a minimally invasive and relatively inexpensive treatment. It seems that facial fillers are the true miracle skin treatment, erasing wrinkles, fine lines, dark circles, and even under-eye veins. Specialists often recommend injecting Restylane or Juvederm facial fillers to provide temporary masking of under-eye veins. These solutions are designed to add volume to facial areas. Rather than eliminate the veins, they simply conceal them by plumping up the eye area and reducing shadowing, making the veins less visible. However, fillers require a fair amount of maintenance, and the results from each treatment only last about a year. Unlike other treatments outlined here, this non-invasive option is not designed to correct or erase large or deep veins. It’s a good choice for those who have small, surface veins in the lower eyelid skin. With that being said, there are a few major benefits to choosing facial fillers as an under-eye vein treatment. Not only do injections help conceal facial veins, they also brighten up dark spots and hollow circles under the eyes. Much like lasers and sclerotherapy, facial fillers are beloved for their convenience and minimal downtime. They’re also a good choice for people who’d like to address other age-related skin issues simultaneously. The list of cons to using fillers to treat under-eye veins may not be lengthy, but some of the disadvantages could be deal-breakers. The fact that the treatment is temporary and limited makes it less than ideal in some scenarios. Surgical vein removal is possible for large and deep facial veins, although it is relatively uncommon. A plastic surgeon is more likely to recommend surgical excision in cases of visible veins on the legs and body. During a procedure called vein stripping, the doctor permanently removes the vein by pulling it out through an incision. Surgical excision presents higher risks than other treatment options, and is rarely recommended around the eye area. A safer vein surgery option known as microphlebectomy may be perfored instead. During this minimally invasive procedure, a plastic surgeon will trace the vein using a marker and tie off its edges using a fine suture, thinner than a human hair. A microneedle is then used to puncture the skin and remove the vein through a small hole. For best results, doctors often pair excision with laser treatments or sclerotherapy. Vein removal surgery is generally performed on deep, large, purplish veins that haven’t responded well to other, less involved treatments. Compared with surgical vein removal in other parts of the body, facial vein surgery presents more risks due to its close proximity to the eyes. It also causes more pain and requires a longer recovery period than lasers or injections. The VeinGogh Ohmic Thermolysis System is similar to laser treatments, but instead of lasers it uses energy in the form of tiny, high-frequency currents to eradicate veins. With the VeinGogh procedure, a high-frequency current is delivered to the vessel through a hair-thin probe, which receives a burst of energy. According to VeinGogh’s makers, this causes the blood inside the vein to coagulate. The blood vessel then collapses and is absorbed into the body. VeinGogh can be used to treat facial veins, broken capillaries, spider veins, and other conditions. The best part about the VeinGogh treatment is that, like lasers and fillers, there’s virtually no downtime and almost no pain involved. In fact, VeinGogh claims to offer a significantly less painful vein removal solution when compared with laser and surgery techniques. Unfortunately, results are not immediate: it can take several weeks before the effects of the treatment are fully realized. VeinGogh is best-suited for smaller spider veins, but can be combined with sclerotherapy for larger veins. While this article looked at the treatment options available, it is important to speak with a specialist and find out which procedure would best help you meet your aesthetic goals. There is a certain level of risk involved with any procedure, but working with a board-certified medical professional, experienced in treating these veins, will help to minimize the potential for complications. 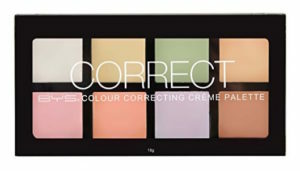 If the veins under your eyes give your face a tired appearance, then it may be time to try color correcting concealers. While makeup isn’t a permanent solution, it’s a fast, effective and affordable way to make those veins disappear. BYS’s eight shade palette is a long-lasting cream formula, made for easy and seamless blending. Unlike other palettes, there are many orange, pink and salmon hues, which are great for hiding blue veins. It’s also sleek and compact, so you can fit it into even the smallest purse for occasional touch-ups throughout the day. 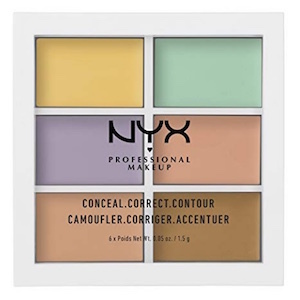 This compact six shade palette is made for on-the-go correcting, concealing and contouring. The color choices provide an all-in-one range that conceals dark spots and veins, brightens features, and accentuates the cheekbones. Its lightweight cream formula is optimal for a natural, full coverage look, and can be applied with your finger, a brush or a sponge. 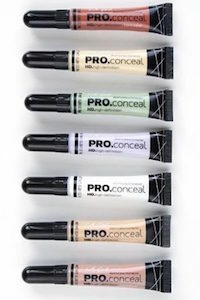 This liquid set comes with six concealers — orange, yellow, peach, lavender, green and yellow — and a bonus highlighter, which is a great product to throw pull out of your bag anytime you need a little added glow to your cheekbones, brow bones or nose bridge. Each color is designed to offer the ultimate coverage for any problem area. The individual bottles allow you to bring only the needed concealer of the day, instead of a carrying around a big palette in your bag. The lightweight cream formula is crease-proof, while still providing heavy duty coverage. If you’re looking for the Cadillac of concealers, you’ve found it here. 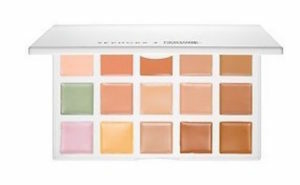 This fifteen shade lightweight creamy set is made to target any problem area you could possibly have, such as dark circles, redness, hyperpigmentation, and dullness. This specific palette is made for light to medium skin tones, but Sephora also sells a medium to dark palette. There’s also a booklet that comes with the palette that explains how to get the most out of it.